Enjoy the debut novel by author Danielle Davenport that explores the life of a young professional that learns the hard way that sometimes friends can become foes. 28-year-old Fallon Scott is a savvy young entrepreneur with her own successful business and expensive taste. After diving headfirst into an unconventional career path, she successfully built her business from the ground up with her best friend, Taylor Smith. But when personalities collide, secrets are kept and motives are revealed. Fallon quickly finds out that sometimes your enemies are closer than you think. Follow Fallon as she tries to maneuver through an emotional rollercoaster without losing her friendship, her business, her mind...or her life. 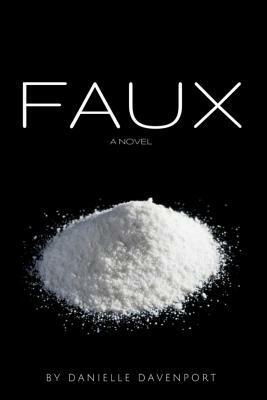 Faux was a surprise of a novel, typical urban fiction with a twist. Davenport took an overused trope--and Dora milajae'd it. Instead of men being the quote bosses in this story--the women took charge. Biggie was right when he said, "Mo money, mo problems." There's an unspoken, almost unseen rift, between Taylor and Fallon. Fallon is ready for the come up; and all that comes with--white Taylor isn't so much ready to grow, but to slow down. Taylor was both likable and not all at the same time. I admired her for sticking with Fallon when they met in college--making sure she had a roof over her head--and wouldn't have to spend her entire collegiate term between her car and God knows where else. But, there was always something I couldn't trust about Taylor. Her actions were questionable--and I read her character out of the side of my eye. Fallon on the other hand worried me. She lived as if she were untouchable, and was a bit too caught up in the luxury her job was providing her. She fell into untrustworthy relationships a little too freely. Her heart was bigger than her intuition. What really stands out about this book is the fact that we have two women running a typically male dominated empire--and I was here for the girl power. What also worked was the fact that there were unexpected twists, this is not typical for urban fiction--at least none that I've read. They tend to have a semi-straightforward plot. There are some dramatic moments but they don't tend to catch you by surprise. I was pleasantly surprised with that aspect of the novel. As a whole, the pacing was pretty well done, and it kept a consistent plot--and story line. I never had to wonder, where the author was going with anything, hallelujah. Nothing like an all over the place story--to frustrate me, quickly. As for what I didn't like, I don't have anything really bothersome to mention. The story was pretty good, with fairly solid characters--and an easy to follow storyline. It didn't knock me off my feet, but I imagine that the author is only going to get better. I'd even look forward to a sequel--as the ending left room for more--in a climactic, non-cliffhanger sort of way.